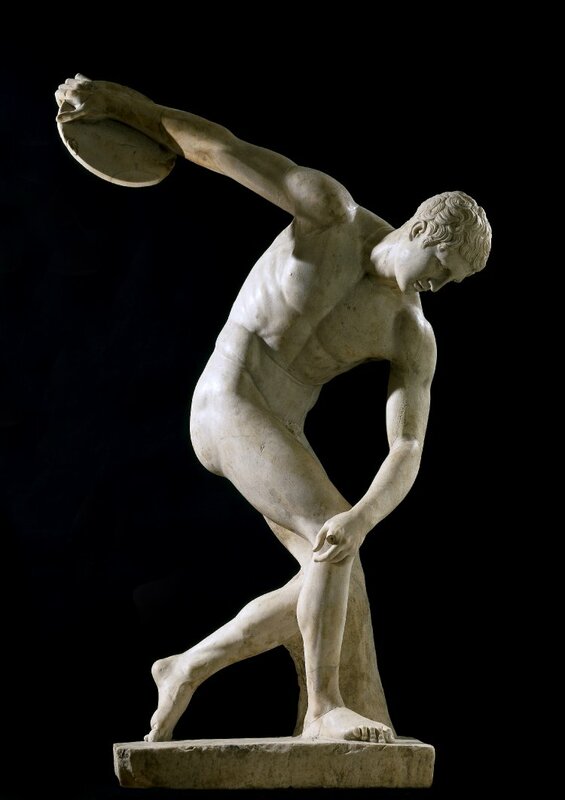 In honor of the upcoming 2012 Olympic Games in London, the British Museum has assembled the flower of ancient Greek athleticism in “a victory trail around the collection” with 12 stops at icons of statuary and art centered around the theme of winning. The exhibit will run from June 1 to September 9 and admission is free. Some of the objects are part of the permanent British Museum collection, like the Townley Discobolus, one of several extant Roman copies of a lost 5th century B.C. Greek discus thrower by the sculptor Myron of Eleutherae, and the Vaison Diadumenos, yet another Roman copy of a lost 5th century B.C. Greek original, this time by Polykleitos of a victorious athlete tying a ribbon around his head. The rarest gem of the dozen is the Motya Charioteer, a larger than life-sized 5th century Greek marble sculpture in the “wet drapery” style of the Early Classic period. It was discovered in 1979 on Mozia, an island west of Sicily which was once the ancient Phoenician city of Motya, and is almost never loaned out from its home at the Giuseppe Whitaker Museum in Mozia. This is the first time he has ever been to Britain. In return, the British Museum is lending the Whitaker the Strangford Apollo, a late Archaic kouros. It’s not certain that the Motya statue is a charioteer — some posit that he represents Hercules or a magistrate — but he certainly has the physique of an athlete and several attributes in common with the Charioteer of Delphi, including the long chiton he wears with a band around the chest. Charioteers were the only athletes in the ancient games who wore clothes. Four bronze nails in his head suggest he once had a circular object around his head, probably a victory wreath. Like the Delphi Charioteer which was sculpted slightly earlier, the Motya Charioteer is an important piece illustrating the transition from the formal rigidity of the Archaic period of Greek sculpture to the naturalistic sculpture of the Classic period. Delphi has a lot more blousy fabric covering up his figure. Motya’s chiton, on the other hand, is clinging to him like a second skin, hence the “wet drapery” style. The exhibit also displays four different Greek vases, each depicting a different sport. The sprinter on a Fikellura style amphora from Rhodes is particularly adorable, so much so that he has been made into an icon representing the victory trail exhibit. You can take a sprint of your own through each of the 12 stops on the British Museum website. There are short audio clips from curators describing the objects and links to further information.